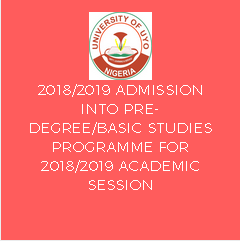 Applications are invited from suitably qualified candidates for admission into a, one-year Basic Studies programme of the University of Uyo for the 2018/2019 academic year. The Basic Studies programme is designed to prepare students for the examinations conducted by the Joint Universities Preliminary Examination Board (JUPEB). Holders of the JUPEB certificate would subsequently be admitted into the 200 level of the degree offered by the University of Uyo through Direct Entry JAMB. Applications are invited from suitably qualified candidates for admission into a one-year Pre-Degree Programme. Limited hostel accommodation is available on campus for female students ONLY.